After the Second World War, the United States, and the other winners has taken home as trophy the studio tape recorders from the radio studios of Germany. On the basis of that machines fabricated the tape recorders in the world. The AMPEX Corporation was one of this manufacturers in USA. 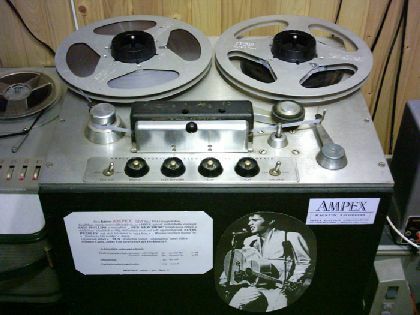 Nowadays, the Ampex Co. is making studio machines too, of course, in digital technology. In a mono version of the machine in the picture has recorded the first songs of Elvis Presley, in the studio of Sam Philips, in Memphis, in 1954. You can hear some special, "probe" songs in the "Hits" menu, recorded by this studio, in 1956!